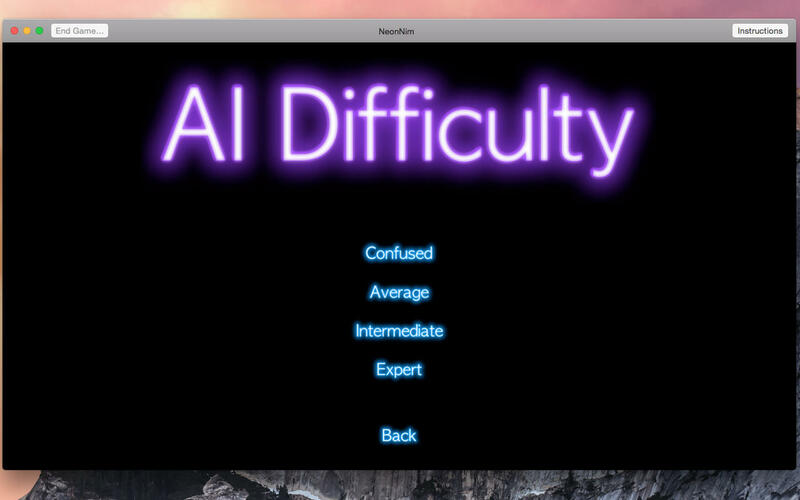 Think you can beat your Mac in a classic game of Nim: The Subtraction Game? The Subtraction Game is a simplified variation of Nim, the Ancient Chinese game. Choose from four different levels of intelligence. Also featured is a two player mode where friends can challenge one another on the same Mac. 1. Each game starts with 10 diamonds. 2. Players alternate turns, removing 1 or 2 diamonds. 3. The player who removes the last diamond wins the game. Please note that NeonNim requires OS X 10.10 Yosemite. • Minor optimizations for macOS 10.12.